The SIE exam will serve as a precursor to taking qualifying exams in candidates’ desired area of expertise. A combination of the SIE exam and the additional test will be the equivalent to securities exams currently being offered. Sponsorship by a member firm will not be required to sit for the exam so that, like many non-FINRA exams (Series 3, 63, 65, etc. ), anyone will be able to register to take the exam. Sponsorship, however, is still required to sit for a qualifying exam. The passing score on the SIE exam will be valid for a period of four years from the date the individual passes the exam. Existing registrants will be considered to have “passed” the SIE exam so that no additional testing will be required in their registered position. This “passing” will be valid for four years upon leaving the industry. However, a qualifying exam will be required if the registrant returns to the industry following a two-year absence and both the SIE Exam and the qualifying exam will be required following a four-year absence. For example, a general securities rep (Series 7) moving into investment banking would need to take the Series 79 qualifying exam but not the SIE Exam. 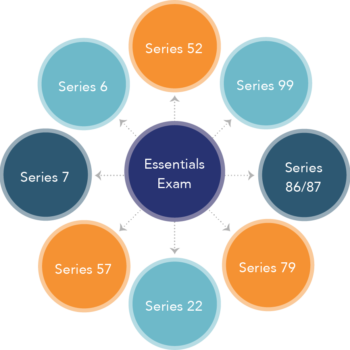 How Could the SIE Exam Impact Your Firm? The SIE Exam can provide a meaningful way to educate new hires and existing employees. With Permissive Registration, firms will be able to develop their employees and associates. Firms may reduce training time and costs by requiring new hires to obtain the SIE Exam in advance of employment. Allow all employees to take the SIE Exam. In many cases, the SIE training could replace the existing “Intro to the Securities Industry” courses which firms provide to their employees. Make the SIE Exam a requirement for all employees, or those in select departments (e.g., legal, operations). This change may require firms to pay for these exams, reimburse employees who have passed them, or have the employee pay. Initially, many firms will support training programs for both the SIE Exam and qualification exams. This may change as the SIE Exam becomes part of university curriculum and career placement programs. STC has built relationships with colleges and universities through our General Securities College Program which will be incorporating the SIE Exam into their curriculum.